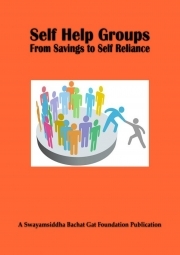 Description of "Bachat Gat - From Savings to Self Reliance (eBook)"
This book deals about Self Help Groups (Bachat Gats). It guides the new and existing groups on topics such as how to form a self help group, rules pertaining to it, how to sustain the group and how to expand vistas and start a viable business enterprise with the support of Self Help Group. The book also focuses on various schemes including project finance schemes available in India. Reviews of "Bachat Gat - From Savings to Self Reliance (eBook)"